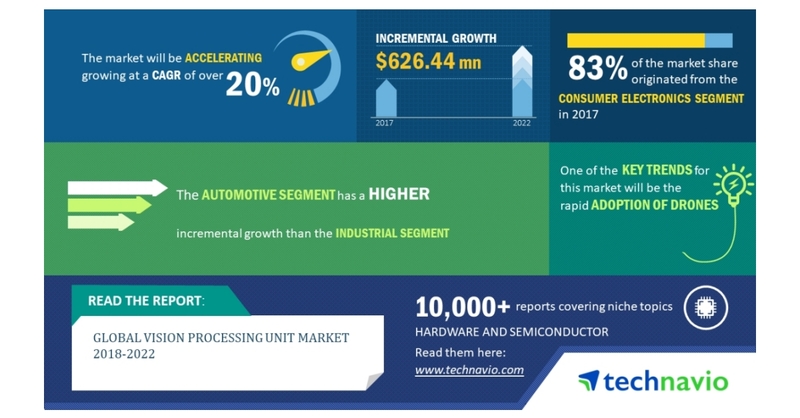 LONDON–(BUSINESS WIRE)–The global vision processing unit market is expected to post a CAGR of more than 20% during the period 2018-2022, according to the latest market research report by Technavio. A key factor driving the growth of the market is the growing adoption of AI and deep learning. AI permits computers to perform functions such as learning, reasoning, and problem-solving that generally require human intelligence. AI collects, analyzes, and stores large volumes of real-time data. This market research report on the global vision processing unit market 2018-2022 also provides an analysis of the most important trends expected to impact the market outlook during the forecast period. Technavio classifies an emerging trend as a major factor that has the potential to significantly impact the market and contribute to its growth or decline. Drones or UAVs are unmanned aircraft, which can be navigated autonomously or by using handheld remotes or global positioning system (GPS) remotes. Drones are widely used for surveillance and rescue, emergency response, high-altitude imaging, forest fire monitoring, flood mapping, humanitarian aid, product delivery, oil spill monitoring, Internet connectivity, and photography. “Drones are equipped with cameras and sonar sensors that are plugged into the VPU. Thus, drones can map and understand the environment. Therefore, drones are also used for environmental monitoring and mapping, soil moisture imaging, hyperspectral imaging, and aerosol source determination,” says a senior analyst at Technavio for research on semiconductor equipment. This market research report segments the global vision processing unit market by end-user (consumer electronics, automotive, and industrial) and geography (APAC, EMEA, and the Americas). The consumer electronics segment held the largest market share in 2017, accounting for over 83% of the market. This end-user segment is expected to dominate the global market throughout the forecast period. The Americas led the market in 2017 with close to 39% of the market share, followed by EMEA and APAC respectively. The APAC region will project the highest growth during the forecast period.